March is the month of EVIL! Starting this Friday, March 2nd, at 6 PM EST, buy any AdventureCoin or Membership package of $10 USD or more to unlock the exclusive Paragon Dreadnought March upgrade bonus items! Get the Paragon Dreadnought gear and the exclusive Paragon Helm House + Dreadnought Bank house item with a 12 month membership or 12000 AC package. 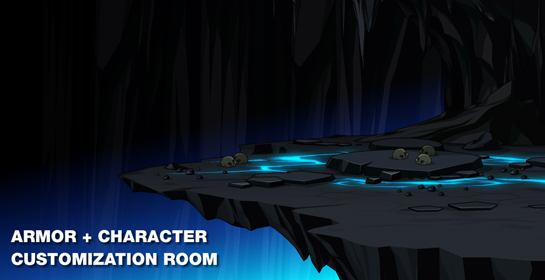 The Paragon Helm House has 6 rooms (including the exterior), plus an armor/character customization room (just like Yulgar's Inn). Gaze into the abyss while you contemplate your new look, then take a screenshot to show all your friends! All packages will also come with the Paragon Dreadnought character page badge, so you can show all your friends who the most loyal member of the Undead Legion REALLY is. The March bonus gear goes rare April 6th, 2018. Want something that's not listed above? If you get the Epic Item of Donated Awesomeness, follow the instructions on the item description and ask the team. They'll see if one is available! 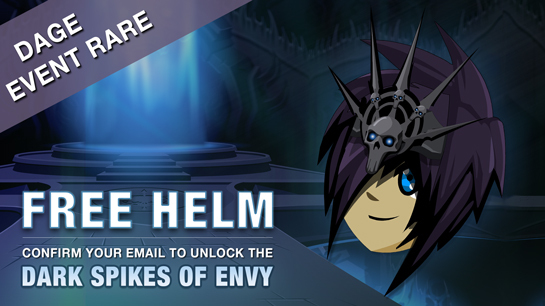 The helm is tagged 0 AC, so you can store it for free FOREVER! The in-game helm does not include a face, so whatever expression you have on your armor will shine through. *Captain Rhubarb will start sending them out some time tomorrow afternoon. Fixed the derps that snuck in on the prologue. Skullcap in Doomwood II shop can now be purchased. 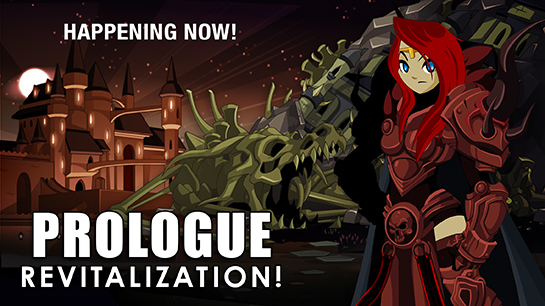 Dual Oblivion Maces of Nulgath have a new description. Pastel Skyguard Captain foot fixed. Chaorrupted Lycan Hunter art fixes. Gridiron Game Gear art fixes. Evil Shop in Shadowfall has returned. Zorbak has been put back in his proper cage. Warlic now responds to quest Speak To The Blue Mage. Nulgath is now purged of the last remnants of Miltonius. Blood Price - No longer gives a random Damage over Time. Class Team Note: Over the upcoming weeks, a few class skill icons will be getting updated. Return to Swordhaven and Shadowfall this weekend as we rebuild and revitalize two of the most popular areas (and more!) in Lore with a smoother progression and new shop and farming rewards. Adding more "Guide Notes" like you see in Robina's text box in Swordhaven Undead, to help new heroes understand where to go next. Updating many NPCs text boxes to help guide new heroes through zones. Adding an Enhancement Shop and instructions to Cleric Dawn, so new heroes have one visible and handy before entering battle. Monster level adjustments, to better match new heroes' levels as they play through the opening areas. Updating item levels in the Chaos Shop: most new heroes are only level 5 when they unlock this. We're adjusting levels give them a few rewards sooner, but also give them a reason to come back to the shop as they level up. Hiding "bonus NPCs" until new heroes have played through the zones at least once. This weekend, find the Dark Knight of ShadowFall armor in the Featured Gear Shop in your game menu. 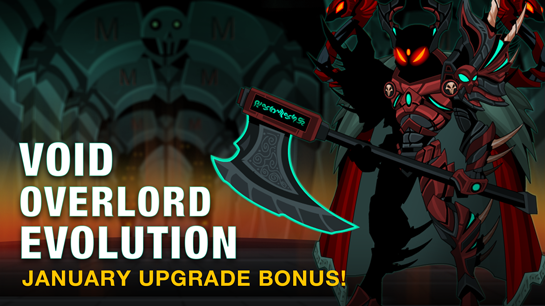 Buy the armor for 1000 AdventureCoins to unlock the rest of the set for free in Battleon's Curio Shop. 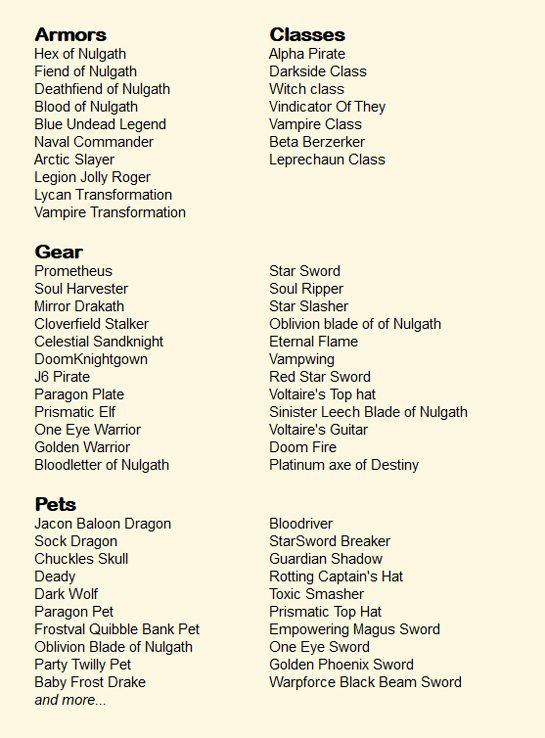 (Each of the accessories will cost 0 ACs, so you can store them in your bank for free, forever!) This set will be permanently available. Theeeeeeeeey're great! 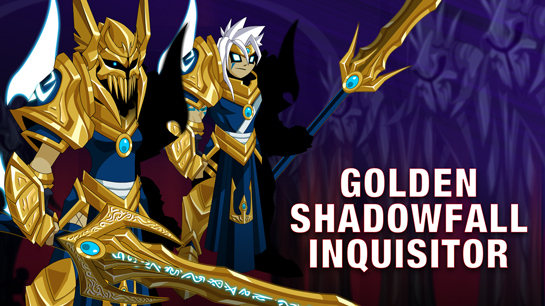 This weekend, complete Empress Gravelyn's daily quest, Inquisitor Inquiry for a chance to get the pieces of the Golden Knight of ShadowFall set. 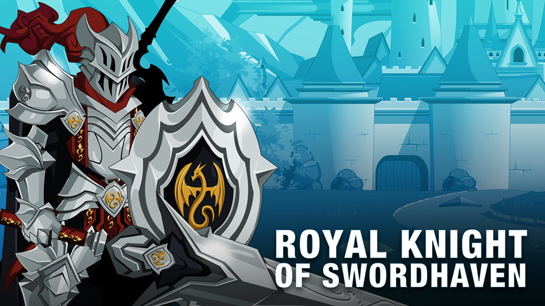 Then battle the Undead Giant in /SwordhavenUndead for a chance to get the pieces of the Royal Knight of Swordhaven set! Each of these sets will be available forever, so if you can't get them this weekend, you've got plenty of time. This weekend, answer Cleric Dawn’s call! The Greenguard Horc tribe has been quiet since 2009… but this week, Dawn needs your help to prevent them from over-running her Portal and reaching BattleOn! 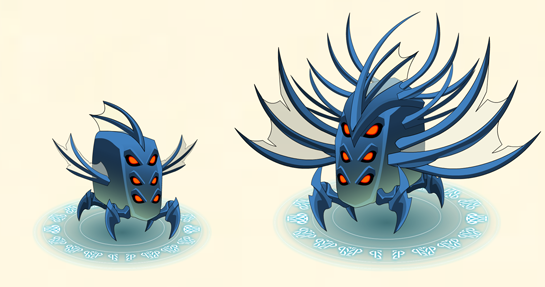 If you were around back in the early days of AQWorlds, you might remember our micro-wars. These zones and their rewards were never intended to go perma-rare, so this week we'll be returning a permanent, static version of the Horc War (and over the next few months, we'll add the rest back in, as well). If you're a more experienced Hero, we've got you covered. We've expanded the Horc War map and added increasingly difficult Horc monsters.., including the level 75 General Drox Ironhide. Get the item drops from the Horc Warriors, then battle the higher level mobs for a chance to get runes that will let you increase their damage ranges (and a small boost to gold)! Why Go Back to Old Zones? Good question! In the last (close to) 10 years, we've introduced over 1,000 unique zones, 3,000+ monsters, and almost more gear than a hero can count. With your help, we've had an incredible amount of amazing adventures, and have built a game we are truly proud of. But just like a Hero never stops training, WE never stop working to improve what we’ve built. Join us this weekend, as we introduce changes designed to help new and experienced heroes enjoy opening zones of our story and the towns of Swordhaven and Shadowfall. Alteon's Royal Armor has a more fitting description now. Gold Parade Helm & Blue Parade Helm are now just ACs, no more merge requirements. Pastel Skyguard Captain art fixes. Ripper Kangaroo moved a little to the side because he was HUGE and blocked the player. Paladin's Benediction got some CC updates. Swank Ultrahat got some CC updates. ‘Slingshot Web’ - Description has been updated. ‘Destiny or Doom’ - Description has been updated. Any classes that had a large amount of space in front of their description has been removed. Class Team Note: These Void Highlord changes should increase your damage short term and have you hitting even bigger crits! The description to Armageddon was incorrect previously as Arbiter’s Wraith was only providing 20% crit damage until now. Moglins are one of Lore’s most recognizable creatures; they are healers, magicians, caretakers, and sometimes battle companions. 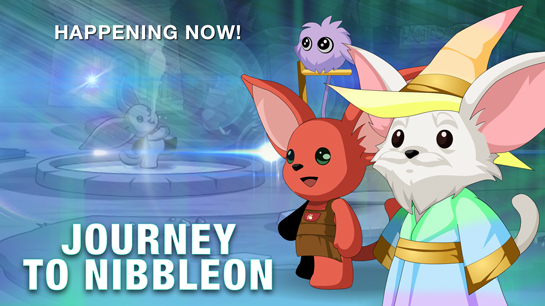 This week, journey to NibbleOn, the village Moglins call home, and learn more about the race that has helped you so often on your adventures (and lend a hand to defend it from invaders out to steal their magic… and moglinberries)! Frostvale may be cool, but this... is... NIBBLEON! The town of Battleon has always been your hero’s hometown in AdventureQuest Worlds. 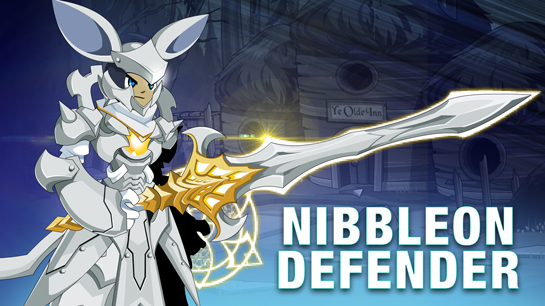 But this weekend, for the first time ever, you’re invited to visit the moglins’ main hometown: NibbleOn! SUPER SECRET SPOILER: we have some pretty cool ideas for expanding NibbleOn in the future. Stryche, the head of HeroMart, is vital to these plans and future additions. 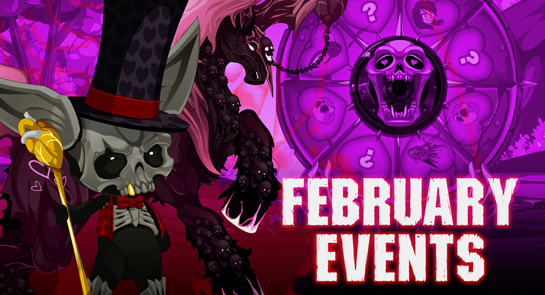 There are 27 new items coming this weekend in the town of NibbleOn (give or take a few that the Makai made off with)! Talk to the different shop vendors, complete their quests, and take on monsters (like the cute-but-deadly DoomKitten) to get fierce, funny, and fuzzy rewards! *Only avilable only during our Hero’s Heart Day, Yokai New Year, and Carnaval events each year. Brew Potion button for “Speak to Alina” now awards quest item instead of sending you to /alchemy. Pink Neon Heart (L) house item loads now. Derp Llama Face no longer thinks its an Alien Overlord. Little Wyrm Of Time no longer decapitates himself. Gong Ji Zhanshi Side Blades no longer fly off your body. Endgame Upset Gear blue lines removed. Void Ripper Scythe fits in the hand now. Prismatic Elf female art fixes. ArchMage of Nulgath Helm no longer has purple outlines. In Seraph map, Ada now has a button to get you back to Adventus if you have finished the story. Graveyln no longer requires you to be evil to use the back button. Traitor Lieutenant now fits in his portrait. First cutscene in Lunacover remade so it no longer lags/locks things up. Nothing to report, but as always, Arklen would love to hear your feedback on his twitter. Hero's Heart Day 2018 is Here! Sometimes the best pairings don’t make sense. Recipe for love: Vordred the PaladinSlayer + Beleen + Cupid’s Cursed Arrows! Beleen loves everyo- wait… Vordred?! This weekend, log in and fight to help your old enemy win the hand of his Pink Princess (and see who else fell prey to Swaggy's plotting). The undead may never die, but maybe they can finally learn how to love. After you battle your way through the event, take on the boss for a chance to get the pieces of the NecROMANCE set, along with the resources to create gear in the merge shops. Getting the sweet new Valentine’s Day gear will be as easy as falling in love! The new VorDREAD armor setand Chateau Swaggy house arrive this weekend plus, return on Wednesday, February 14th to find Aranx’s adorable Armor l’Amour set. Armure L'Amour set arrives on Wednesday, February 14th! DanielPP2's Festa das Cores Carnaval set also arrives in the Featured Gear Shop this weekend as we continue our Carnaval 2018 celebration! 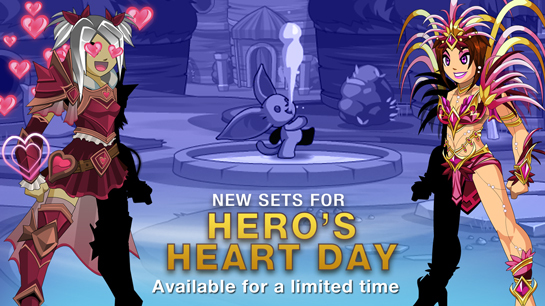 Hero's Heart Day event rares shop Find the VorDread armor set and both the Swaggy of Love and Pinky the Unicorn pets in the Featured Gear Shop in your game menu starting tonight. Beleen's Pink Dye merge shop Complete the holiday event, then battle the boss to gather the Pink Dye Beleen needs to pink-ify your gear. Chateau of LOVE house shop Complete the holiday event, then talk to the Bouncer outside Chateau Swaggy to begin his quest for SwagBucks. Spend those in his House Shop or battle the boss to get a mansion's worth of lovely furniture for your house (28 new items in all). The /Party for Carnaval Continues! Our Carnaval 2018 celebration continues this weekend! Find the Festa das Cores (Party of Colors) armor set in the Featured Gear Shop in your game menu, created exclusively for AQWorlds by fellow hero and artist, @daniel_pp2. 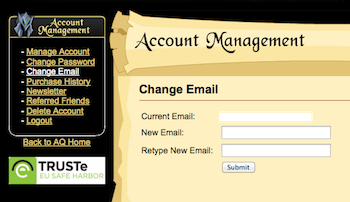 Help Pages Leveled Up: Better, Faster, and More Helpful! 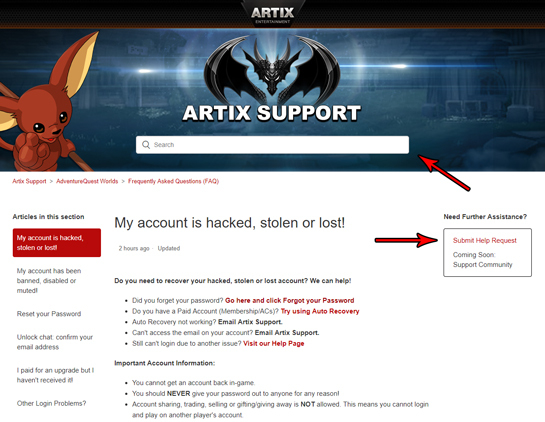 So last March, the Artix Support Team made their battle plan, geared up, and set out on the journey to redo… everything. This was a huge project. 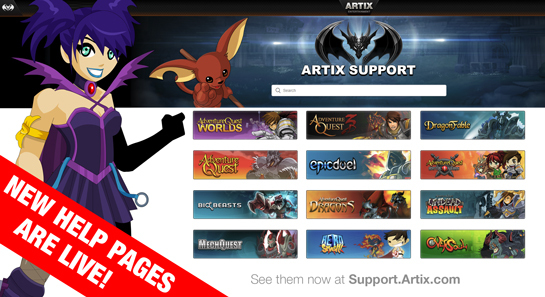 They rewrote and/or updated over 8,000 articles across 12 games, our online store, our forums, and the Artix Portal site. Based on early feedback from testers and some of our community members*, we knew this was the right decision. 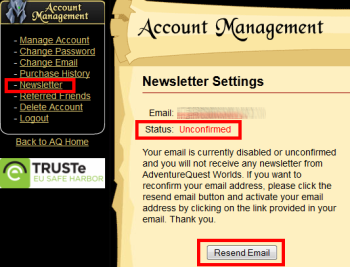 Early last month, we set the hard date for AQWorlds’ transition. Be polite and honest. ** The Support Team are here to help you, but it’s much easier for them to do their job when they aren’t being called names or threatened. **These guidelines are good for writing any email, or interacting with anyone on a day-to-day basis. They have a combined 19 years of support and game experience, and their only job is to help you with any account, game, or technical issues you may encounter. *** "Agent" sounds much more epic than "representative." Based on your feedback, we may also begin offering support on Social Media sites like Twitter and Facebook. Let us know what you think and what you’d like to see next! River Fishman’s Wallet now on Fishmen in /river. Frogzards finally calmed down and came out of hiding in Nexus. Greenguardwest Slimes now with 100% more Goo (Glue). Death Pit Token drop fixed. Arcane Paragon Pet (NPC) has finally adjusted to his new surroundings and will let you look in his shop again. Parades Shop is now open. J6’s Black Friday stuff and Feast map taken out again until next Harvest / Black Friday. One-Eyed Drow Helm +5 CC issue is now fixed. Zorbak’s Baby Dragon has stopped bucking Zorbak off when they move now. Death’s Custom Apprentice Hood’s eyes glow better. Cyber Warrior foot stays the same when running now. Shadowflame Champion eyes are now CC to eye colour. Helms in set also fixed. Bejeweled Blade quest gives Treasure Hunter rep now. Extras! - Odds & Ends Things! So this week we don’t really have any one thing to discuss, just a couple of things that come up regularly. Female armours with an error in the arm. This was caused by a specific template which was used, and is not an easy fix. Because this is not easy, and our resources are limited, we won’t be able to go back and fix every one of these at this time. If any new ones are put in like this, those will definitely be fixed though! Surfboards and arms going through them. This is caused by the layering in how models are built. The layering on the character model goes hand -> weapon -> shoulder-> rest of body. This is what allows things to be where they are supposed to be (most of the time!). When a weapon is at an odd position, such as how surfboards are carried, this causes the arm to stick through. Unfortunately, this is not something we can fix at this time either. When the Harpies face-off against the Loyalists, all of Lore goes CRAZY! So, football fans, kick your puntin' foot into high gear, because it's half-time, and we've opened the /punt map! Score a field goal AND a rockin' character page badge by punting Twilly across the field and into the end zone! WHEN: It's half-time, so NOW! WHO: Harpies, Loyalists , the AQW Team & YOU! WHAT: "/Cheer for your favorite team!" The half-time shop sports a stock full of fantastic fan favorites! So grab your pompoms and /cheer for your favorite team! It all begins NOW! And by popular request, the GridIron Game Gear and the Endgame Upset armor are now color customizable. If you already had the armors, you've already got the new versions. If you don't, find them in the Superbowl Shop in the /punt map. 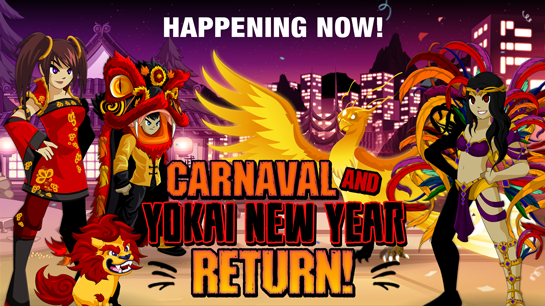 Carnival, Yokai New Year, and MORE comin' at you! Every year, we celebrate Yokai New Year in Akiba. This year is the Year of the Dog (and the color yellow) in the Chinese Calendar. 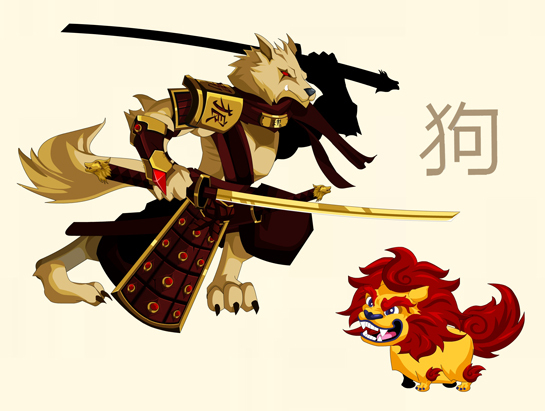 Talk to Princess Ai no Miko and battle a visiting Lycan Shinobi, Zhongchéng. Battle him before the Emperor to show your respect for his skill. He has a chance to drop the Gold Foo Pup pet and helm. Swordhaven has always been a battlefield between Good and Evil! 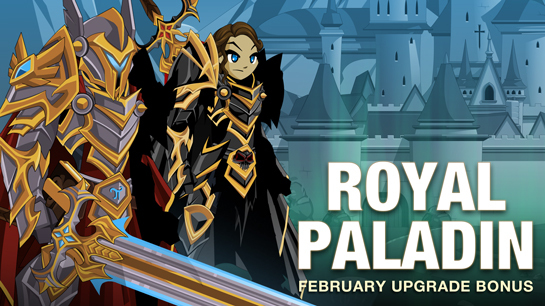 Starting this Friday, February 2nd, at 6 PM EST, buy any AdventureCoin or Membership package of $10 USD or more to unlock the exclusive Royal Paladin February upgrade bonus items! Get the Royal Paladin gear and the Cursed DeathKnight set with a 12 month membership or 12000 AC package. (Are you seeing a pattern here?) So when you log in this Friday, you'll see a Philip the Weather-predicting groundhog (a wee little ground-dwelling rodent.) If you aren't familiar with strange US folk traditions, here's the story of Puxatawnee Phil, who inspired this NPC. Talk to Phil in Battleon and complete his quest to save his brother (also named Phil... it's a family thing) from General Porkon in the Horc Fort. In the real world, this Sunday is the SuperBowl. 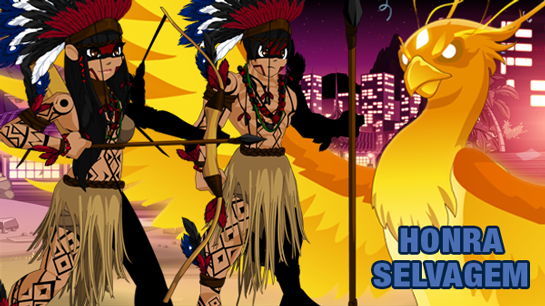 In AQWorlds, we hold LoreBowl! (WAY less chance of summoning lawyers with that name, you know?) 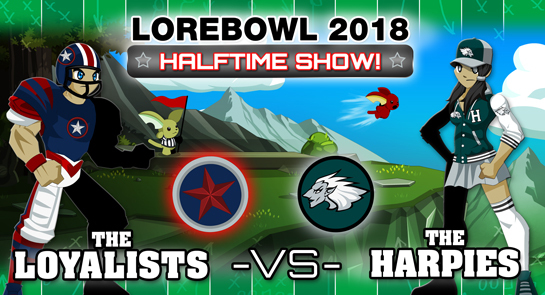 This year, the Loyalists face off against the Harpies, and during their half-time game, WE open up the /punt map so YOU can get your kicks seeing how far you can make Twilly fly. Get 100 yards to unlock a special character page badge! All of the LoreBowl armors + accessories are tagged as "Seasonal Reoccurring" items in-game. They will become available again each time the football team they represent goes to the Superbowl in the real world. Find them in the Underworld War Merge shop. Each pet is 0 ACs. 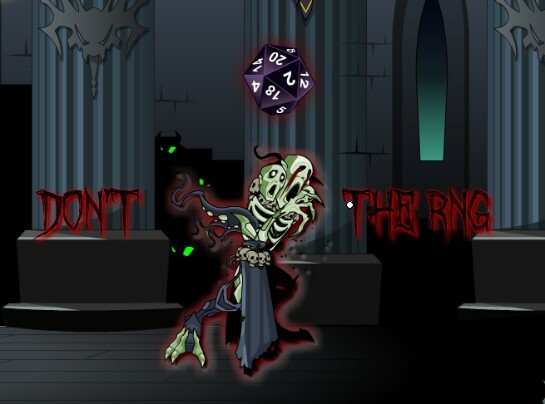 The Larvae has no price, but the Bloodsucker of Nulgath requires the Larvae + 1 Bone Dust. Swordhaven has always been a battlefield between Good and Evil! Starting this Friday, February 2nd, at 6 PM EST, buy any AdventureCoin or Membership package of $10 USD or more to unlock the exclusive Royal Paladin February upgrade bonus items! Get the Royal Paladin gear and the ShadowFall DeathKnight set with a 12 month membership or 12000 AC package. Get more gear and save more of your real-world gold with our largest upgrade packages! Unlock ALL of the February upgrade bonus items, including the exclusive ShadowFall DeathKnight set, with our 12000 AdventureCoin or 12 month membership packages. All packages will also come with the Royal Paladin character page badge, so you can show all your friends the power to save (or destroy) Swordhaven lies in your hands. The February bonus gear goes rare March 2nd, 2018. Nulgath the ArchFiend is BACK to help us start 2018 off right. Starting this Friday, Janaury 5th, at 6 PM EST, buy any AdventureCoin or Membership package of $10 USD or more to unlock the exclusive Void Overlord Evolution January upgrade bonus items! 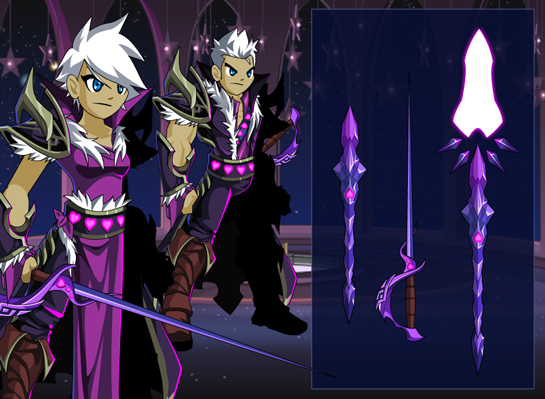 Get the Void Overlord Evolution gear and the color customizable Enchanted Void Overlord Evolution set with a 12 month membership or 12000 AC package. All packages will also come with the Void Overlord Evolution character page badge, so you can show all your friends that you are a TRUE member of the Nulgath Nation. The January bonus gear goes rare February 2nd, 2018. Nulgath the ArchFiend has worked with Artix Entertainment on and off for years. He was an integral part of creating the original designs for many of our characters and areas. He is currently focusing on a few personal projects (secret! ), but came back to work with us on several sets for AQWorlds and HeroMart.